and it looks like it's going to be another scorcher, I do hope you are all enjoying the hot weather and managing to keep cool when necessary. now isn't that a nice easy one for you. Do take a look at the blog as there is some fantastic inspiration from Team B with some great projects. a very lovely and adorable card! i love all the beautiful layers on it! This is so pretty Pat. A gorgeous image and a beautiful card design. I love your card Pat. Sweet image with beautiful lace and dp's. It's 35 deg.C here today but with the humidity it feels like 43....me no likey! Thanks for joining us at One Stitch At A Time this week, good luck....see ya soon! Beautiful card! Love the image and lace! Your flowers are so pretty! Thanks for sharing with us at Crafty Sentiments! Hi pat this is absolutely gorgeous i adore that image also that lace, wow, it look spectacular, the colours of you card as well as the image and embellishments look ACE. 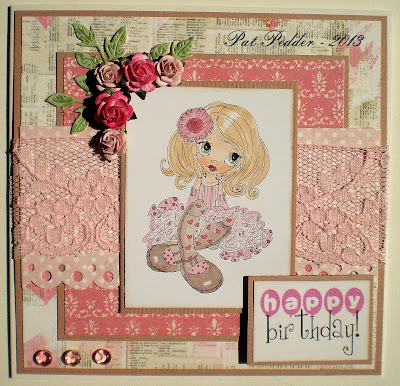 So pretty, thank you for joining in the Crafty Sentiments female birthday challenge. Beautiful birthday card! Love the soft colors and great detail! Thanks so much for playing along with The Pink Elephant! Thanks for joining the challenge at Card and Scrap.